Websites related to Yoga and Meditation. You do not have to pay for the awakening of the Kundalini. You did not pay anything to become a human being. The amoeba had no bank account. Fish became reptiles without establishing any business plan. If you put a seed into the earth, it will sprout, without any payment, because the seed has the inbuilt capacity to sprout and the earth has the necessary quality to support the process. It is a living process." 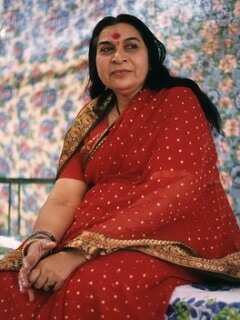 Meta Modern Era is a book in which Shri Mataji Nirmala Devi discusses the shortcomings of modern Western life. It was first published in 1995. The website presents extracts from the book, in a variety of languages. As traditional values and moral awareness have become increasingly undermined, sometimes even destroyed, many people find themselves confused. Humanity needs guidance about right and wrong and about the means to bring to an end this age of spiritual and moral darkness. "We have to have another higher house for the U.N. We can get very well known judges, like those of the World Court at the Hague. These people should be elected by the whole world and should not come from any one particular country. They should have the necessary detachment and wisdom, as well as a great understanding of the problems that affect the peace of the world." "Talking about meditation is like trying to explain how a recipe will taste after the ingredients have been cooked. Nothing can beat the real experience of tasting the food. Similarly, until you have been successful with meditation, you cannot imagine how it should feel. When meditation is successful, whether in Leicester or anywhere, it takes you beyond your mind, so the experience cannot be conveyed to the mind in the form of words."